Habit Burger Grill will be opening their first store in Utah in early 2013 to satisfy the seemingly never-ending need in Utah for burgers, to Utahns just begging for more California chains. Don’t mind me–I’m just a grumpy guy tired of paying $10 for a combo meal at some of these fast-casual burger chains. To be fair, though, one thing that Habit Burgers differentiates themselves on is their prices. A straight up “charburger” (seriously?) only runs $2.95 and a charburger combo comes in around $6. I’ve never eaten at Habit Burgers, but judging by the prices it sounds like they’re gunning for In-N-Out’s market. Let’s all say a prayer for better fries than In-N-Out’s cardboard sticks. Habit is a sister-company to Cafe Rio, so if that’s any indication, they’ll do quite well here. I’m glad to see them opening near the old Granite Furniture building. With the recent addition of Bruges, the eventual–maybe–opening of Caterina nearby, and the future trolley stop, it sounds like that area’s going to see its fair share of development pretty soon. Salt Lake City, Utah – The Habit Burger Grill is opening its first Utah location on Thursday, January 10th in the Sugarhouse/2100 South neighborhood development within the Granite Furniture block. 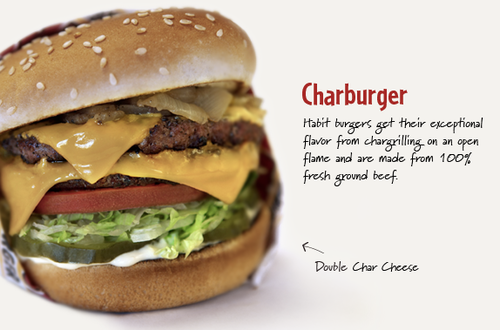 The Habit is best known for made-to-order “Charburgers” grilled over an open flame and consistent, friendly service. The Habit’s commitment to fresh, quality ingredients along with reasonable prices has made the fast-casual restaurant hugely successful with families in the Western United States of California and Arizona where there are currently 68 Habit Burger Grill locations. “The Habit is a truly unique brand that offers customers an overall eating experience not found anywhere else,” says Russ Bendel, President and CEO of Habit Restaurants, LLC. “We are extremely excited about bringing our famous Charburgers and friendly service to the people of Utah, and specifically to this new development in Sugarhouse,” he adds. The Habit is a sister company to Café Rio, another well-known, successful, family oriented, fast casual restaurant in Utah. Following the opening of the Sugarhouse location, The Habit has plans to open two additional Utah locations within the year. In addition to burgers starting at just $2.95, The Habit’s menu includes sandwiches made from grilled, marinated chicken and tri-tip along with fresh, line-caught Albacore tuna. Diners can also choose from freshly prepared specialty salads tossed to order, onion rings, sweet potato fries and a variety of hand-blended shakes and malts made from real ice cream. Customers at The Habit Burger Grill will also notice the reasonable prices that are less expensive than casual dining or other “gourmet burger” establishments.